As did many Canadian painters, J.W. 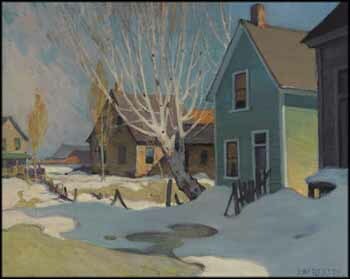 Beatty studied in Paris, and although his early affinities were with the Barbizon school, once he returned to Toronto in 1909, an autumn sketching trip to northern Ontario transformed him. He declared that what he saw there would "make me forget the Old World for the rest of my days," and he became a champion of the Canadian landscape. A precursor to the Group of Seven, he painted with A.Y. Jackson and J.E.H. MacDonald on a 1914 trip to Algonquin Park, and he was an early influence on Tom Thomson. In this fresh depiction of a rural town can be seen Beatty's refined treatment of light and colour. The houses are painted with lively pastels, both warm and cool, and his handling of sunlight brightening the sides of the buildings and casting cool shadows is assured. Beatty's fine eye for design can be seen in such elements as the rounded shapes in the melting snow, the radiant central tree and the evocative corridor view to the hills in the distance that completes this serene canvas.